If you don’t take care of your hair in winter you face the reality of split ends and actual seasonal hair loss. No one wants that. Good news though, with a little TLC you can prevent both. Preventing winter hair damage is all about keeping moisture in your hair. All you need to do are some key dry hair remedies. Not sure what to do? Don’t worry, we’ve got you covered. Follow these 10 tips to prevent dry brittle hair. Use a weekly hair treatment to help replace the moisture lost throughout the week. Hair dries out faster in winter due to there being less humidity in the air. You can do an easy hair treatment at home once a week by using your conditioner. Slather on the conditioner and then let it really soak in for 30 minutes before you wash it out. If you want to try something other than conditioner you can try making your own super moisturizing hair mask. The most popular these days is an avocado mask. Mash up an avocado with an egg and then smooth it onto wet hair. This mask is rich with vitamins, minerals, and essential fatty acids. Leave it on for 20 minutes and then rinse until clean. You can use butter or warmed coconut oil to restore the luster to your hair. Apply either and cover your hair for 20 to 40 minutes. Then shampoo it out and enjoy your beautiful hair. Washing your hair less often will mean less of your hair’s natural oil gets stripped away. Your hair’s natural oil is the best protectant for the harsh colder weather. It will also protect your scalp from getting dry, itchy, and flaky. You should also invest in a boar bristle brush. These brushes have natural fibers that will feel great on your scalp. They will encourage circulation in your scalp aiding in repairing any damage your scalp has already experienced. It will also work wonders at working your hair’s natural oils through the length of your hair. Just give your hair a good brushing before you go to bed and you’ll wake up with beautiful hydrated hair. Water-based moisturizers tend to evaporate quickly from your hair. By using an oil-based product, the moisture stays on your hair longer. Hair with texture tends to benefit from this method the most. If your hair is wavy, curly, chemically relaxed, or coiled your hair is more prone to becoming brittle in cold weather. Going platinum is tough on the health of your hair. During winter let your roots go a bit darker and use a demi-permanent dye for a dark shade. This dye will slowly wash out. That way when summer comes around again you won’t have to fry your hair getting the darker shade out. A leave-in conditioner can help you with those fine baby hairs that seem to get a mind of their own in winter. 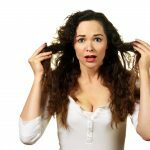 Static electricity is a problem in winter, and our hair tends to be a victim of it. Have you heard of the dryer sheet trick? Well, stop it. Instead, use a leave-in conditioner to lock in moisture and combat static flyaways. So your shampooing less, keeping your hair hydrated, and then you put a hat on. Now your hair is limp and lifeless looking. Try a little dry shampoo will bring volume and life back to your hair. It will make your hair look more full and expand the hair shaft. The weather is already drying on your hair, don’t double down with lots of high heat styling too. 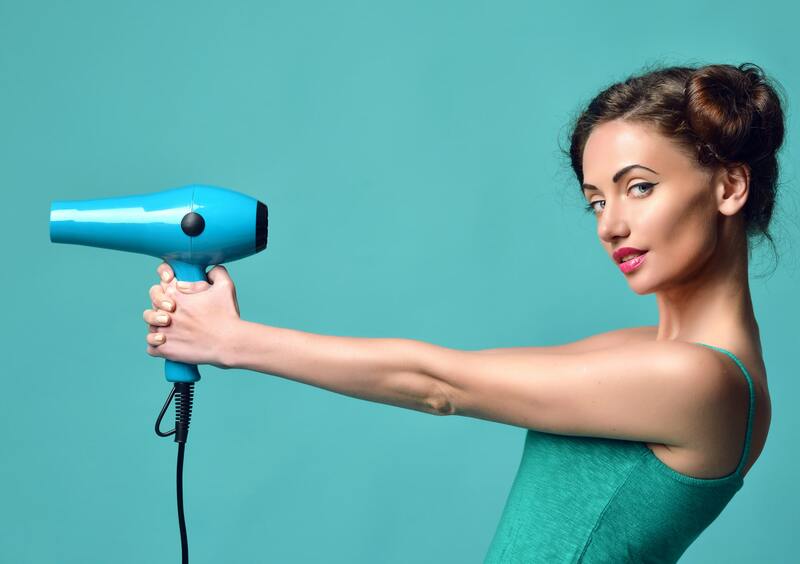 If you must use heat styling, be sure to apply a heat guard to your hair first. For an alternative, try hairstyles that don’t require you to heat style. Try a bun, braids, or twists. Never ever go outside in the dead of winter with wet hair. Think about it this way, water expands when it freezes. So as the water in your hair gets colder, it begins to expand. Your hair shaft can’t take that, so it breaks. Some fabrics are tougher and rougher on your hair than others. Unfortunately, those fabrics tend to be the warmest. Look for wool, cotton, or other course warm fabrics that have a silk or satin lining. This way you get all of the warmth, without all of the damage. The best thing you can do for your hair is to let it hydrate overnight. Just like your skin, the night air leeches moisture from your hair. Use an oil elixir to soak in overnight so it has plenty of time to soak into your dry hair. Just be aware that it can mess up your pillowcase, so have one designated “hydrating case”. If you have textured, relaxed, or curly hair you should cover it with a bonnet or silk scarf. These will cut down on the friction created which can damage your hair. The winter weather can wreak havoc on your tresses. You don’t have to accept it though. Combat dryness and damage with these dry hair remedies. Create a schedule so you moisturize weekly and overnight. Reduce your shampooing and heat styling. Take inventory of your winter hats and make sure they are all lined with silk or satin. Use a leave-in conditioner to help fight those fly-aways. Finally, consider embracing the winter season with a darker shade to help ease the damage done to your hair. Need a good mask for your curly hair? Check out the Devacurl’s hair mask treatment.